Only a week until Thanksgiving and I’m guessing you’re more concerned with whether to use real cranberries or the solid gel that falls out of the can with a ‘fwump’ and keeps it’s ringed shape throughout the festivities than you are with hearing about a conference seven months in the future. But you really should pay attention to this one. The first annual Enterprise Engagement Networking Expo is coming to the New York area in June 2010, and it will not be your traditional conference. The Networking Expo will be held at the Doral Arrowwood Resort in Rye Brook, NY – and we own the hotel for two and a half days. No distractions, just business – with a unique twist. As an attendee you’ll be walking, talking and seeing nothing but engagement. Exhibitors and sponsors will be available throughout the conference, giving you unparalleled access to the information and, more importantly, the people, who can help drive engagement in your business. A unique Hosted Buyer program and direct marketing campaign co-sponsored by leading industry publications and associations to attract corporate professionals. Opportunities to get to know attendees through interactive roundtable sessions, coffee breaks, luncheons, receptions, dinners and special events over a 2½-day period. 8 hours of dedicated exhibit time and a half day with buyers in intimate interactive sessions, including pre-arranged meetings with Hosted Buyers. A combination of turnkey exhibit exposure adjacent to conference rooms, including: 10 suites for scheduled meetings, 10 high-impact main lobby locations, 18 exhibits in conference lobbies and 28 roundtable exhibits. Refreshments throughout the day adjacent to conferences and exhibits. …and We’re Loading Up On Knowledge. The EEA Networking Expo will also feature a special education program on Enterprise Engagement developed by leaders in the field and designed for executives and managers who are interested in learning more about the art and science of engaging customers, distribution partners and employees. The education program addresses the economics and implementation issues related to engaging people in business, including customers and distribution partners, salespeople and all other employees. 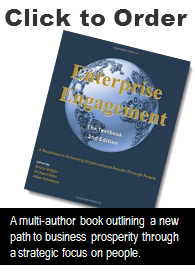 It offers a unique combination of speakers representing all aspects of the emerging field of engagement. In other words VALUABLE, ACTIONABLE INFO. Take time to visit the site and see all the EEA Networking Expo has to offer and sign up for the newsletter that will update you on this unique opportunity to really dig into the field of Enterprise Engagement. Mark your calendars now – June 3 – 5, 2010!